Georgia Cranko was one of only five solo artists selected to work with Elizabeth Ryan as part of the recent 3-day Beyond Technique Residency at the Riversdale property (Bundanon Trust) on the NSW south coast. 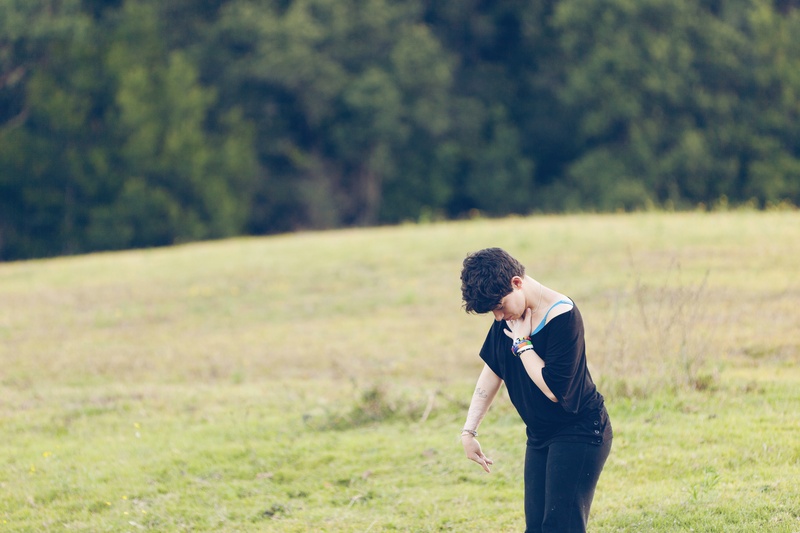 There is a distinct lack of opportunities for people in Australia with physical or sensory impairment to be involved in dance projects with well established choreographers. Yet through relationships I’ve formed over the past four years with the NSW dance sector with partners such as Accessible Arts, Ausdance NSW and Carriageworks and the Australian Youth Dance Festival (AYDF), Georgia has attended several of the projects I’ve led to develop her dance skills and movement vocabulary with dancers with and without disabilities. When you see Georgia dancing, communicating through precise body articulation which is sometimes interrupted by her less controllable movements, you will witness a slight-framed yet powerful performer with an unstereo-typical dancer’s body. Georgia fully engages you. Her work is mesmerising and thought provoking. When you reach out to touch me, I recoil. Do I know you? Do you know me? Breathe in. Breathe out. My skin and self are distorted and disjointed. My body, my skin contains what I am, not who I am. Who I am is caught between our physical exteriors. Our flesh fools us into thinking we are different, into thinking we are alone, but we are not alone. I found it incredibly challenging to trust my own creative judgment and way of moving, which are the pitfalls of working solo, but it was a growing experience for me. Georgia will take part in Accessible Arts’ next Catalyst Dance Masterclass Series which will be held at the Bangarra Dance Studios in Sydney across three weekends during August / September. This series of workshops are for people with and without physical / sensory impairment and acquired brain injury. They will be led by Sue Healey, Dean Walsh and Philip Channells. Click here for more information. Georgia Cranko is a student at Sydney University, majoring in gender studies. Georgia is particularly interested in the physical body and how it can be manipulated and interpreted. In 2010, Georgia received a grant from the Don’t Dis My Ability campaign to explore how disability fits into this body paradigm. With the grant, she created Living within Context – a solo performance piece for the stage, based on her life with Cerebral Palsy. She works in numerous mediums, such as poetry, writing, movement and video. She is a passionate advocate of disability in the arts and has given various presentations, discussing the importance of art in the disability sector. Last year she was awarded a scholarship to participate in the Australian Youth Dance Festival held at NAISDA, Gosford and performed in Lythophytes & Epiphytes choreographed by Philip Channells. Georgia was also a part of the Dirty Feet Choreographic Lab in March, and performed in Laura Lima’s Man=flesh/Woman=flesh in April as a part of the Kaldor Public Arts Projects’13 Rooms exhibition in Sydney.